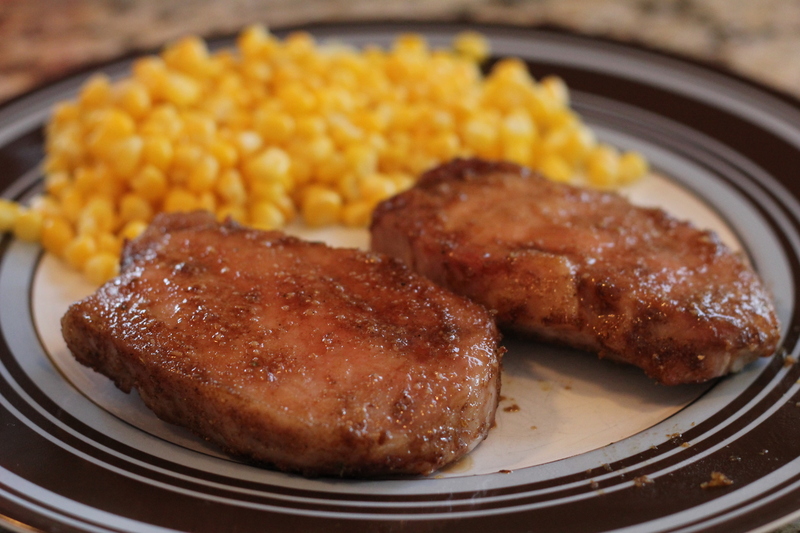 Given the incredible simplicity of this recipe, these pork chops couldn’t have been better. I whipped these up in only about 15 minutes, and they were delicious! And as if that’s not great enough, they’re also weight watchers approved. OK so in case you don’t know, I am a teacher. Yesterday was the firs day of school so it was INSANE. Neither the teachers nor the students are truly ready for the early morning starts, the long days, and the additional chaos that comes with the first few days of school. So yesterday when I got home, I hopped on my computer for a few minutes to check email and pull up this recipe to get started on dinner. Well…I was just SO exhausted, and I could feel my eyelids getting heavy. I tried to fight it, but it was futile. I ended up taking a little half hour nap during the time when I was SUPPOSED to be cooking. Luckily, this recipe is so quick and easy, that we were still eating at a reasonable time and not way later than intended. I was really impressed at how good these were. I thought they’d be dry or tough or plain. Instead, they were juicy, tender, and flavorful. Definitely one of the best quick, easy, and healthy entrees you’ll find. Combine brown sugar, Worcestershire, cumin, garlic powder; blend into a paste. Coat chops with paste; broil 5 min on each side. Definitely going to try this. I love quick and easy and “only a few ingredients I have in my pantry already” recipes. Thanks! Yes the ““only a few ingredients I have in my pantry already” recipes are the best kind! I love when a quick, and relatively cheap meal does not mean sacrificing flavor.